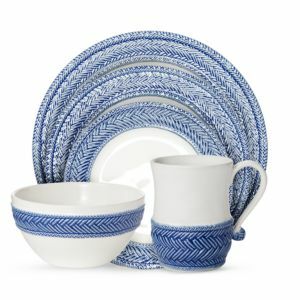 European style casual dinnerware you will look forward to using every day. Fine china dinnerware. Dishwasher safe. Microwave safe, low heat only. A reactive glaze lends this stoneware an organic, one-of-a-kind finish, while genuine gold trim adds a touch of elegance. 16-piece dinnerware service includes four each of: dinner plates, salad plates, bowls, and mugs. Crafted of porcelain. 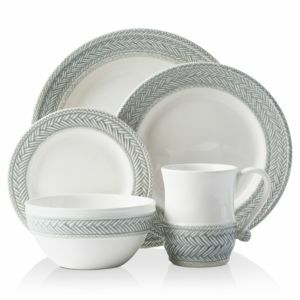 16-piece dinnerware service includes four each of: dinner plates, salad plates, bowls, and mugs. Crafted of porcelain. A reactive glaze lends this stoneware an organic, one-of-a-kind finish, while genuine gold trim adds a touch of elegance. A reactive glaze lends this stoneware an organic, one-of-a-kind finish, while genuine gold trim adds a touch of elegance. Classic and a timeless range. 12-piece dinnerware set. Porcelain with golden decals. Porcelain dinnerware with golden decal incorporated. Classic and timeless range. Porcelain dinnerware. Dishwasher safe. Made in Portugal. Handcrafted dinnerware. Earthenware. Service for 4. Made in Portugal. 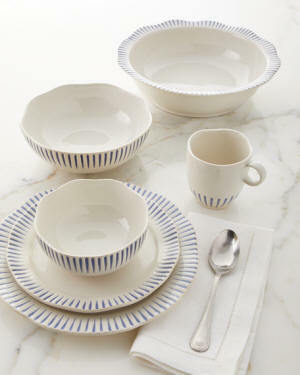 Handcrafted porcelain dinnerware. Made in Portugal. 12-piece dinnerware set. Classic and a timeless range. Porcelain decal with golden finish incorporated. Service of four Soda lime glass Handcrafted ceramic dinner plate with pewter rim. Food, microwave, dishwasher, and oven safe. Made in Italy. Magical horses and mythical birds from the pages of a Scandinavian folktale are brought to life in vibrant indigo. Earthenware Dishwasher and microwave safe Designed with a subtly textured floral border, this glazed stoneware collection lends a touch of modern elegance to any table. Glazed stoneware. Dishwasher and microwave safe Artist Lou Rota has long been drawn to the beauty of the natural world. Her passion for entomology was piqued during the early days of her career, which were spent producing science and natural history documentaries. Today, from her West London studio, Rota designs the whimsical bugs, flowers and birds that grace her ceramics. This set's vintage-inspired curves exhibit a biologist's dream assortment. A creative combo of crisscrossed designs defines the eclectic ease of Crafted by Wainwright's Pompeii Blu Land place setting. Ride the waves of stylish stoneware with the Crafted by Wainwright Pompeii Blu Sea place setting featuring bold cobalt curves and gold-tone flashes. Brush strokes and bold grids give an eclectic effect to the varied vibrant pieces in the Crafted by Wainwright Pompeii Blu Sky place setting. Bringing a sense of naturalistic glamour to your dinner table. Ceramic stoneware dinnerware. Four-piece sets. Dishwasher and microwave safe. Made in Portugal. Made of ceramic stoneware. Dishwasher, microwave, oven, and freezer safe. Dinner plate with floral detail. Dessert plate with floral and bird detail. Melamine. Dishwasher safe. Set of four floral-print napkins. Solid border. Cotton sateen. Glassware dinnerware. Dishwasher safe. Ceramic stoneware. Dishwasher, freezer, microwave, and oven safe. Made in Portugal. Ceramic stoneware dinnerware pieces sold individually. Dishwasher, microwave, and oven safe. Made in Portugal. Ceramic stoneware plate. Dishwasher, microwave, freezer, and oven safe. Made in Portugal. Ceramic stoneware plate. Dishwasher, microwave, freezer, and oven safe. Made in Portugal. In our chic Mist Grey hue, everything you need to set a stylish place at your table—perfect for parties, and eminently useful for everyday. 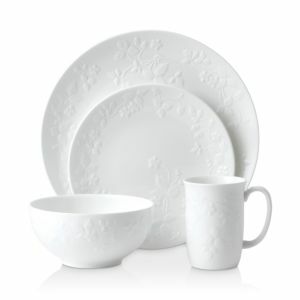 Creamy white centers juxtaposed with pewter-toned borders create handsome and infinitely versatile dinnerware that inspires both intimate dinner parties and grand gatherings Exquisite enough for formal occasions but designed for everyday use, this dinnerware is adorned with the familiar acanthus-leaf motif on the rim of each piece. Stoneware dinnerware. Dishwasher, microwave, oven, and freezer safe. Made in Portugal. Stoneware dinner plate. Dishwasher, microwave, oven, and freezer safe. Made in Portugal of domestic material. Handcrafted, hand-painted dinnerware. Ceramic stoneware. Handcrafted Tangier Multi dessert/salad plate. Vibrantly hued and patterned ceramic stoneware. Dishwasher, freezer, and microwave safe. Made in Portugal. Inspired by the French basketweave found in equestrian and nautical traditions, this exclusive dinnerware collection by Juliska is highlighted by textural braid details in a smoky finish. Ceramic stoneware. Dishwasher, freezer, microwave, and oven safe. Made in Portugal. Inspired by the French basketweave found in equestrian and nautical traditions, this collection is highlighted by textural braid details, lending enduring warmth and style to each stoneware piece. Handcrafted dinnerware. Porcelain. Dishwasher safe. Made in Italy. Handcrafted dinnerware. Porcelain. Dishwasher safe. Made in Italy. Handcrafted dinnerware. Porcelain. Dishwasher safe. Made in Italy. Three-piece place setting includes: dinner plate, salad plate, and bowl. Crafted of porcelain. Microwave and dishwasher safe 12-piece place setting includes four each of: dinner plates, salad plates, and cereal bowls. Crafted of fine earthenware. Octagonal plate made of fine earthenware.